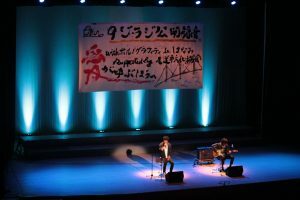 「9ジラジ公開録音 with ポルノグラフィティ in しまなみ supported by 尾道市文化協会　愛が呼ぶほうへ」と、迫力ある書体で書かれた幕が会場に掲げられたところで、ポルノグラフィティが登場!! PG participated in the public recording of the special radio program at Innoshima. PG had a warm welcome and enjoyed the event! !